Moving away from a home where you have lived for years is never an easy thing to do, especially if you are moving to another city or across the country. Living in a new home can be exciting at first, but around the holiday season you may find yourself missing the ones you love even more. If you find yourself away from those you love around the holidays, there are some things you can do to help mitigate the pain you may be experiencing while missing family and friends during this time of year. Keeping sentimental objects nearby, such as Christmas or holiday ornaments that you inherited from your mother or grandmother, and decorating with them will bring back loving memories. Decorating your new home with your own personal touch will make it feel more familiar. If possible, bring some pieces of furniture that belonged to family members, and this will help make you feel more at home. Feeling sorry for yourself during this time of year can be an easy thing to do, but staying home and dwelling on your feelings may only make them worse. Get out of the house and spend time with friends as much as possible during this time of year so you don’t feel as lonely while missing your family. Moving to a new city, state, or even country can be a life-changing experience for you. Meeting people who are new to the area, and may be going through the same thing, will help you to not feel so alone. Host some dinner get-togethers, cookie exchanges, or gift giving parties to help meet new people and share the holidays with them as you would your own family. Moving to a new home can be an exciting adventure, along with meeting new people. And remember, the hard part is over. You have already moved your belongings to a new residence with the help of your professional movers. 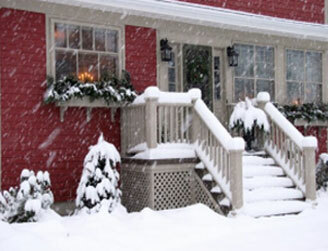 You can now get settled in and enjoy a memorable holiday season in your new home! This entry was posted in Uncategorized on December 15, 2018 by BBD Web.